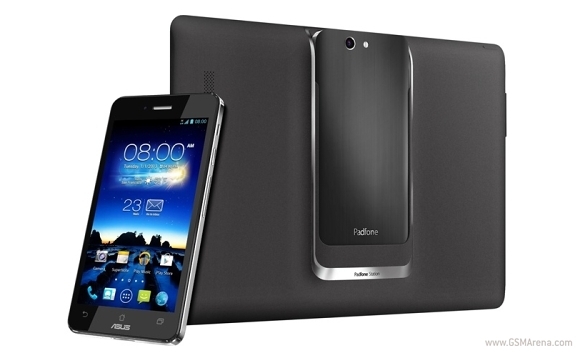 Asus quietly unveiled the PadFone Infinity Lite in Taiwan. The device is a slightly less powerful version of the Asus PadFone Infinity 2 which was announced last year. The PadFone Infinity Lite swaps the Qualcomm Snapdragon 800 SoC of its bigger brother for a Snapdragon 600 chipset with 1.7GHz quad-core CPU. The tablet dock has remained the same with a 10.1” 1080 IPS display and 5,000mAh battery. The rest of the specs of the Asus PadFone Infinity Lite include 2GB of RAM, 32GB of built-in memory, 5” 1080p display, 13MP camera, and 2,400mAh battery. Oddly, the device is listed as booting Android 4.1 Jelly Bean. However, we will be surprised if doesn’t ship with Android 4.4 KitKat. The Asus PadFone Infinity Lite will be released in Match for 13,990 TWD (about $463). The docking station will be priced at additional 7,000 TWD (about $230).